The origins of America's prowess as a world manufacturer began with gun manufacturing where there was a need for large volumes of high quality, small component parts that were interchangeable. 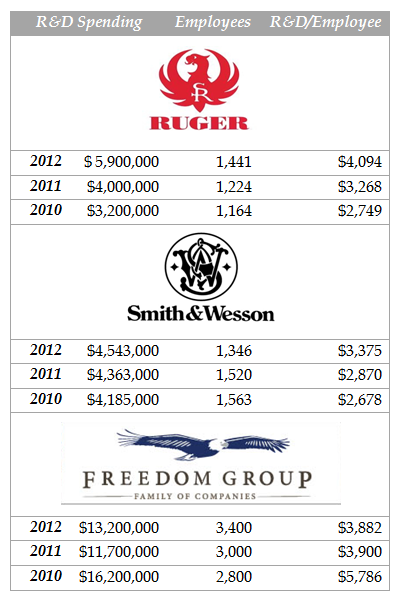 The U.S. gun manufacturing industry continues as a large domestic industry. It is a highly regulated industry in which the entire supply chain continues to engage in product and process improvements. Many of the industry's ongoing product and process improvements are eligible for Federal and State R&D tax credits. As a result of the Newtown, CT tragedy and subsequent law changes or proposed changes, several gun manufacturing companies have moved or are considering moves to states eager to embrace the gun industry. In the process of a move and/or expansion, there are many opportunities to redesign and optimize production processes; much of this work is eligible for R&D tax credits. Table 2 below is a summary of six such companies. Most are in the ideal phase of their move/expansion to take advantage of these R&D opportunities. According to the U.S. Patent and Trademark Office, almost 1,000 patents have been issued under the broad classification of "firearms" since the beginning of 2008. In the continuing quest for higher shooting accuracy, faster loading, a higher degree of accuracy of ammunition, shooter safety, and ease of use all at the most economical cost, many opportunities for R&D continue to exist among gun companies and their suppliers. In addition to the development of sophisticated new gun and ammunition technology, new machining processes and facility improvements, by the primary manufacturers to meet the increased quality and reduced cost objectives, may qualify for research and development. Suppliers, including precision machine shops, engaged in continuous innovation may be eligible for R&D tax credits as well. Some examples of new gun technology include the TrackingPoint Precision Guided Firearm which has recently made news headlines. This gun integrates precision hardware, digital optics, and tracking technology to improve shooting accuracy. New technology is also highlighted in the "Top 10 Inventions of the Year" - published by the U.S. Army. Another relatively new, but hotly debated technology is microstamping; where the gun imprints a microscopic code on any ammunition fired from it. Proponents of the technology argue that microstamping increases the likelihood that a gun owner involved in a crime can be identified. Opponents point out that this is still an expensive technology that hasn't performed consistently in testing and can be easily circumvented by criminals. While many U.S. gun companies continue research and development in these innovation objectives, perhaps the most public of gun technology improvements has been in the area of gun safety. In light of recent events, gun safety has received newly focused attention. Several commercial companies as well as some universities continue to be engaged in gun safety research using a variety of technologies. Federal funding for research related to gun safety and gun violence has been restricted since the mid 1990s, but in light of recent events, a change may be imminent. In early 2013, the National Institute of Justice issued a solicitation for comments on current gun safety technologies by interested stakeholders and issued a report summarizing their findings. As a result of this solicitation, a comprehensive report describing technologies currently being explored was created. Some of them are at a technological maturity level where they may be incorporated into production items; others are still being developed and may be eligible for federal R&D tax credits. Token-Based Technologies - requires the use of an additional physical item such as a ring, watch, card, or bracelet to allow for the operation of the system. Radio Frequency Identification (RFID) Technologies - the wireless use of radio frequency electromagnetic fields to transfer data for the purposes of automatically identifying and tracking tags attached to objects. Biometric Technologies - utilize unique features of individuals as the “key” to identify authorized users. Some examples of biometric technologies include fingerprint, palm print, voice, face, and vein pattern, although not all of these are used for firearm authorization. Dynamic Grip Technologies (DGR) - an emerging biometric authentication method based on the human grasping behavior. A dynamic biometric is a combination of physical and behavioral characteristics that are measured over a duration of time versus a point in time. Optical Technologies - authorization techniques that utilize optical methods for identification may rely on spectroscopic data such as slight variances in skin color, or image data such as vein pattern recognition in the palm of the hand. One specific example of a project that could be eligible for federal R&D tax credits is the further development of the Smart Gun. Since 2000, New Jersey Institute of Technology (NJIT) has spearheaded efforts to develop a personalized handgun that can instantly and reliably recognize one or more pre-programmed authorized users. This would be incorporated into child-safe handguns and prevent guns from falling into the wrong hands in other situations as well. This gun's safety features are based upon Dynamic Grip Recognition; a technology invented by NJIT professor, Michael Recce. Researchers have evaluated the system using law enforcement professionals as test subjects to demonstrate that the technology works with a wide range of users and firing postures, under stressful conditions and even while wearing gloves. The next step is to use the authentication signal from the biometrics to enable or disable the firing mechanism. While this was not part of the original NJIT research plan, it is deemed to be a necessary step to secure private sector investment and commercialization of the technology. NJIT has spent nine years and $4 million in grants to develop this technology and they say it works 99 percent of the time. But they know that's not good enough. Getting it to work all the time, they say, could take years and substantially more funding than the university now gets. "It's still very crude," said Donald H. Sebastian, senior vice president for research and development at NJIT. He said it would take "about two years of steady effort with proper funding" to develop a working smart gun prototype. In summary, many opportunities exist for R&D credits in the gun industry and this should be kept in mind as companies and suppliers increase their sophistication and/or redesign/relocate their manufacturing facilities.